Health Exchange Activity Heats Up As Deadline Is Extended : Shots - Health News Two Republican governors announced Thursday afternoon that they would not create exchanges in their states. A Democratic governor chose a hybrid model for her state. Then, the federal government pushed back the states' decision deadline, again. Nebraska Gov. 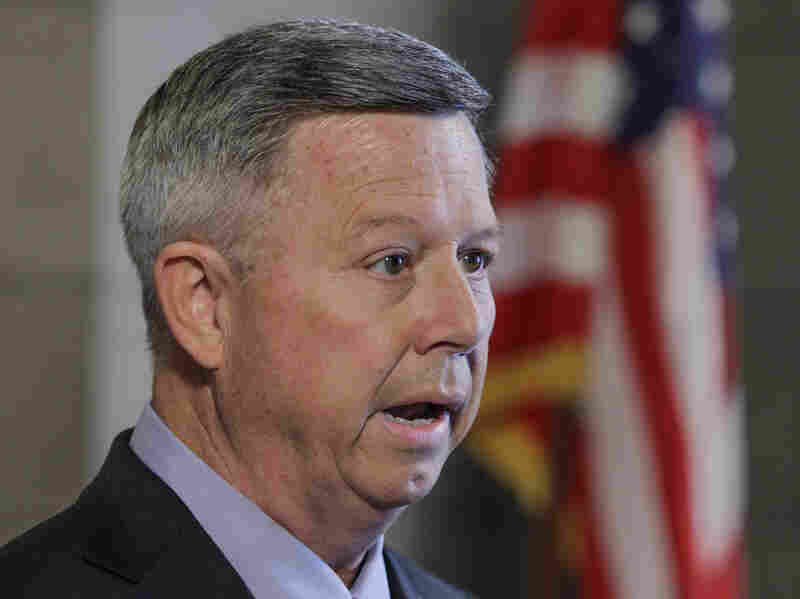 Dave Heineman announced Thursday that his state will choose the federal health insurance exchange program. There's nothing quite like a deadline to focus the mind. Even a deadline that's not quite real. Friday was originally the day that states were supposed to not only tell the federal government whether they planned to run their own health exchanges but also how they planned to do it. Last week, however, the feds extended that deadline, so states would have to only say yay or nay by Friday on the issue of running their own exchanges. If they want to partner with the federal government, they can wait until as late as February to speak up. And no matter what, if a state fails to act, the federal government will set up an exchange in that state for it. Thursday night, shortly after this story was posted, that deadline got extended again. Health and Human Services Secretary Kathleen Sebelius told states in a letter they could now wait until Dec. 14 to submit both their decision and their plans if they want to do an exchange themselves. Thursday afternoon alone, three governors — South Carolina Republican Nikki Haley, Nebraska Republican Dave Heineman and outgoing North Carolina Democrat Bev Perdue — all announced their decisions. The Republicans said they would not be pursuing exchanges in their states; Perdue said North Carolina would very likely pursue the partnership model, a hybrid state-federal exchange. Haley announced her decision in a letter to Sebelius. "The law fails to give South Carolina any flexibility and decision-making authority that would enable us to truly construct the program in a manner that would offer the most meaningful benefit to our citizens," Haley wrote. Nebraska's Heineman echoed those sentiments. "The reality is that the federal health care law is being totally dictated and totally controlled by the federal government," he said in a statement. Heineman also said that building the exchange would cost the state too much money, even though federal funds are available to offset those costs. In Indiana, Gov.-elect Mike Pence, currently a Republican member of the U.S. House, sent a letter to outgoing Gov. Mitch Daniels, also a Republican, urging that the state not establish its own exchange. Some governors who previously said they would not participate are reaffirming those decisions, including Texas Republican Rick Perry. His spokeswoman told The Texas Tribune today that the state won't design its own exchange because there is "really no such thing as a 'state exchange.' "
But others appear to be changing their tune, most notably Rick Scott, Florida's Republican governor. After vowing to have no part of the health law, Scott earlier this week told The Associated Press he wants "to get to yes" and is ready to negotiate with federal officials.